1 R IRISH, Op HERRICK 4, Helmand, Afghanistan. 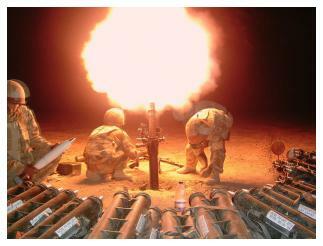 Mortar firing during a night 'contact'. 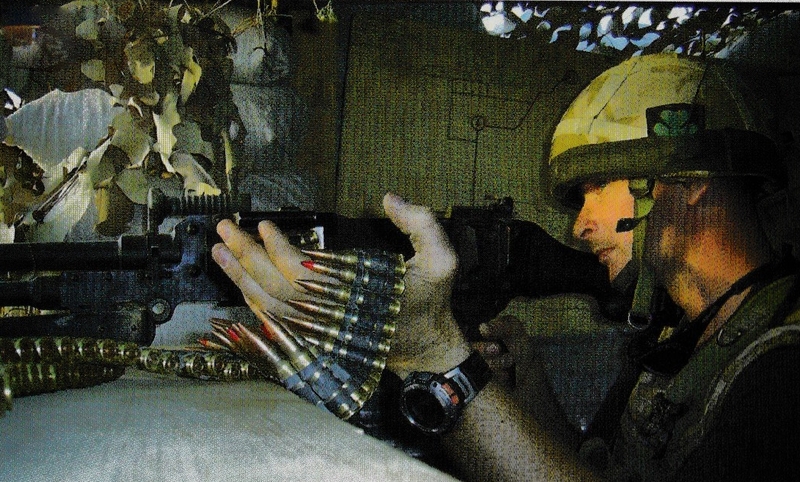 The 1st Battalion The Royal Irish Regiment formed two rifle platoons and a mortar section, in July 2006, to reinforce the 3rd Battalion The Parachute Regiment in Helmand Province, Afghanistan on Operation HERRICK 4. Barrosa Platoon was formed by B Company and Somme Platoon by D Company. After seven days in theatre, Somme Platoon and the mortar section were warned for Op SNAKEBITE, the move to to relieve 3 PARA personnel and reinforce the in-place Danish Recce Squadron coalition partners in Combat Outpost Griffin in Musa Quala. The local population had fled during the intensive fighting in the days before they had arrived. The thirty-eight R IRISH had joined some 140 Danish soldiers to fight the Taliban for control of Musa Qaleh. The Danes had suffered casualties from coordinated Taliban attacks and on Somme Platoon's third day, two soldiers with gunshot wounds were casevaced. Although the Taliban were reluctant to attack at night, thanks to Outpost Griffin's night vision devices, they continued to mount ground attacks, often several times a day and employed indirect fire weapons, including mortars and 'Chinese Rockets'. The Danish Squadron was extracted on 26 August and replaced by a 3 PARA Company HQ and Barrosa Platoon. The new fighting force became known as 'Easy' Company. Having observed the extraction the Taliban may have believed the position to have been weakened or abandoned. They mounted a 2-hour attack soon after and received heavy casualties with one fatal casualty in Easy Company - LCpl Hedrington. For the next three weeks, the Taliban attacks were beaten back as the defenders employed support from mortars, artillery and air assets including Harriers, Apache and US A-10 'Warthogs'. It was during this fighting on 1 September that LCpl Paul Muirhead and Ranger Anare Draiva were fatally wounded, and another 12 soldiers from both platoons were wounded in action. The local Afghan police too suffered casualties with one killed and five wounded. After three weeks of combat, a cessation of fighting was brokered on 13 September by the local elders with the Taliban. It was hoped that when the coalition forces withdrew, the Taliban would honour their agreement to cease local hostilities.